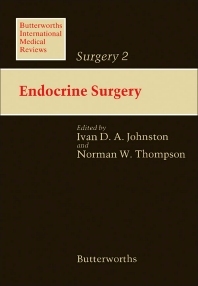 Butterworths International Medical Review, Surgery 2: Endocrine Surgery is a 12-chapter text that describes various surgical procedures for the management of a specific endocrine problem. This book deals first with the principles of thyroidectomy and its application in thyrotoxicosis management. The subsequent chapter discusses the management of clinically solitary nodules without definite evidence of malignancy, such as lower cervical adenopathy or recurrent laryngeal nerve palsy. This topic is followed by considerations of reoperative parathyroid surgery; adrenalectomy for Cushing’s syndrome management; percutaneous transhepatic portal and pancreatic vein catheterization for patients with organic hyperinsulinism, hypergastrinemia, and carcinoid syndrome; and pancreatic transplantation. This text further examines some surgical considerations of pancreatic islet cell and the pituitary in patients with multiple endocrine neoplasia type I. The concluding chapters explore the benefits and limitations of pre- and post-operative treatments of gastrinoma. These chapters also describe the principles and application of surgical treatments in primary aldosteronism and pheochromocytoma. This work will be of great value to established and in training endocrine surgeons, endocrinologists, and workers in other fields, including radiology and pathology.